So far we have raised over £17,000. But what happens to the money? The funds so far have been donated to The ARCHIE Foundation, the official charity of Royal Aberdeen Children's Hospital. A short video from the ARCHIE Foundation is below. 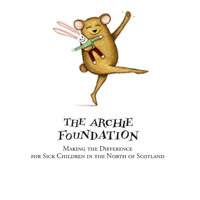 The ARCHIE Foundation helps sick children and their families in the North of Scotland, providing essential support. They buy specialist equipment, support families, create amazing hospital environments, enhance staff training, buy toys, fund research, provide specialist staff and respond in emergencies. We are delighted to be able to support the ARCHIE Foundation. More details of how we raise money are provided below. Without the support of our main sponsor, Ecosse Motorcycles of Aberdeen and Dundee, we wouldn't be able to raise the amount of money we do. The money we generate from ticket sales is used to cover the costs of running the events. There are a lot of costs which may not be immediately obvious: venue hire, appearance fees and expenses, marketing and media, transporting bikes etc. Fortunately, we have a few generous sponsors whose direct financial support, donations of prizes and special rates make it possible. All profits made from ticket sales, after covering the costs of running the events are donated to charity. At each event we run a raffle and/or an auction. The raffle ensures that everyone has an equal chance of winning a prize irrespective of their budget. The auction for special prizes generates a higher return. Prizes at the events have included Ecosse Motorcycle Vouchers, signed canvas prints, a signed helmet courtesy of RigDeluge, Mal Maison vouchers, Knockhill BSB Passes and pillion rides at Knockhill with the racing legends. At each event we are delighted to have some of the ARCHIE Foundation team present. They are on hand to provide more information about the work they do and of course to collect any donations. At previous events we have made A4 prints of the riders available free of charge for fans to collect autographs. A donation to ARCHIE, no matter how small is always welcomed. As the organiser of the events I take no commission or fee. My time is given freely to planning and organising these events as I want to ensure that we generate as much money for charity as possible. I cover the cost of this website personally and produce all the marketing material myself in order to keep costs down. Motorcycle Legend Events is not a registered charity. We only arrange these events and then donate the profits to charity. On behalf of the charities we support, thanks for supporting Motorcycle Legend Events.